We have updated the website and it now open and ready for visitors! We hope neighbors will visit and share information and we will happily make sure neighbors get information. Our Facebook page is also connected so join up. Feel free to share and meet your neighbors!! Thanks to everyone who came out for a great afternoon of neighborhood fun. We had a wonderful time, fabulous food and a very special thanks to Mayor Gray and Council member Bill Farmer for joining us. Thanks to Bonnie Adkisson for the pictures. Check out this great news!! We are getting our own local farmers market in the neighborhood! The Ashland Park Neighborhood Association (APNA) Picnic has been scheduled for Sunday, September 27 from 5:00 pm – 8:00 pm at Harvey park at the intersection of Fincastle and Desha Road. As usual the annual meeting will be a business meeting with election of street representatives. This year we will elect one representative from each of the the following street combinations: South Ashland Park/Central Avenue (700 block), Hanover Avenue/Ghent Road, and Desha Road/Fincastle Road (900-1000 block) for a total of three (3) representatives. The total Board is made of of four representatives from each street combination for 12 members plus a representative from Hanover Towers Condominiums. Representatives serve four years and are eligible for re-election. Those elected will officially take office January 1, 2016 but will be encouraged to attend the September, October, and November/December meetings for information purposes. The Board usually meets the last Thursday of each month at 5:30 p.m. rotating meetings in members homes. The representatives from each street combination make up a nomination committee to submit names for nomination for their street. In addition any person who is a resident of any Association street may submit their name for nomination or may be submitted by another resident with their permission. The nomination shall include, the name, address, phone number, email address, and a resume of the person nominated with any supporting documentation. This should be sent to the President of APNA, Bob Sessum, 101 South Hanover Avenue, Suite 6 L, Lexington, Kentucky 40502 or email to bsessum@iglou.com. In addition to the business session, there will be a gathering of adults and children for a picnic with the APNA supplying the entree composed of hamburgers, veggie burgers, hot dogs and paper products and beer and wine and non-alcoholic beverages (water and soft drinks). Each person or family is asked to bring a side dish and their own chairs. It was a grand time to be had by all last year and we hope to see more of you this year. Later there will be a time to RSVP so we will know how many are planning to attend which is very helpful. But for now, mark your calendars and reserve the date for a neighborhood gathering. 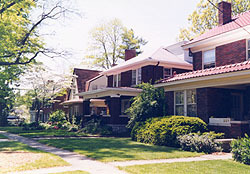 The Ashland Park Historic District is an early 20th century residential neighborhood of primarily single-family homes. At the time of its development the district was located at the eastern edge of the city of Lexington. In 1904 the Clay family hired the architectural firm of the Olmsted Brothers of Brookline, Massachusetts, the famed family of landscape architects including Frederick Law Olmsted Sr. and Frederick Law Olmsted Jr., to draw up plans for a residential neighborhood on the 600-acre estate. Constructed over a 15-year period, the development was completed around 1930. The lots sold for approximately $2,500 each, with deed restrictions on the most prominent lots. The development was designed to include many trees, large areas of green-space, and curving streets with few right angled intersections holding true to the Olmstead trademark. A wide variety of architectural styles can be found in Ashland Park including Colonial Revival, Craftsman, Bungalow, Tudor Revival, Dutch Colonial Revival, Prairie, Georgian Revival, Spanish Eclectic, French Eclectic, and Italian Renaissance, attesting to the varied tastes and styles of the day. Ashland Park continues to be a desirable residential neighborhood. Visitors can either drive or walk through the neighborhood and enjoy the beautiful green spaces and varied architectural styles. Ashland Park Historic District is located adjacent to Ashland, Henry Clay Estate off of East Main St. The district is roughly bounded by Richmond Rd., South Hanover Ave., Fontaine Rd., Woodspoint Rd., Fincastle Rd., and Sycamore Rd. The houses in the district are private residences and are not open to the public. Enter your email address to follow The APNA Website and receive notifications of new posts by email. Bluegrass 10 K Don't forget Richmond Rd will be closed!